Form wills simplify do-it-yourself will drafting. A good form will, prepared or approved by your state bar association, eliminates the need to research probate procedures and will requirements in your jurisdiction. Statutory wills -- state-approved form wills included in state probate statutes -- are best. Large or complicated estates may require legal assistance, but form wills serve well for many simple estates. Consider that the simple will an attorney prepares is likely a form-will template adjusted to your particular situation. Read your form will. 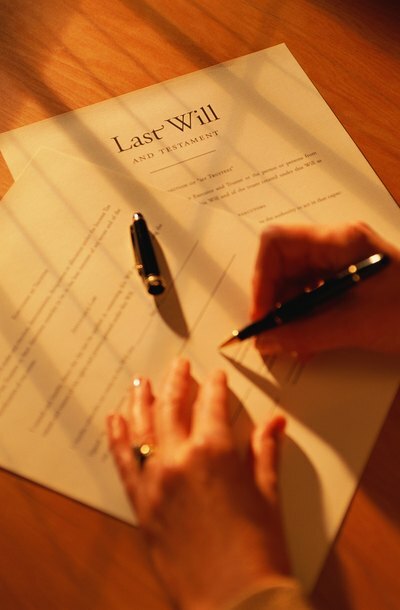 It contains three parts, a section identifying the testator, a section incorporating bequests and appointments, and a signature section for executing the will. Fill in the opening blanks by identifying yourself using your full name, date of birth and current place of residence. The residence address determines the appropriate probate court, as wills enter probate in the county in which the testator resided. The introductory will language affirms that you meet the requirements to draw a last testament in your state, including age and mental competence. Check jurisdictional age restrictions if you are under 18 years old. Determine who you want to inherit property at your death. Consider your blood relations, your friends, anyone financially dependent upon you and any associations you support. States generally impose few restrictions on heirs. Fill in the inheritance information in the bequest section of the form will. Name your children in this section, devising each at least a nominal amount to prevent an inquiry into whether you forgot a child, which may entitle that child to a statutory share. If you make individual bequests of specific property, describe it accurately and unambiguously. Consider your minor children. If your spouse survives you, she usually becomes the caretaker, but name a guardian just in case. Select a trusted friend and check with him before you execute the will to ascertain his willingness to serve. Name a separate financial guardian -- a bank or trust company, for example -- to care for your children's assets until they reach majority. Fill in this section of the will with complete identifying information, including phone numbers. Do the same with the will section appointing an executor -- the person who administers the will through probate. Sign your will. An improperly executed will is a void will, so take this requirement seriously. Most states require a testator's signature in a form will to be witnessed by at least two adults. Choose witnesses who are neither heirs under your will nor named in the document in any other capacity. Advise the witnesses that the document is your last will and testament. It is not necessary that you describe your bequests nor that the witnesses read the document. Sign it in their presence; they sign in the witness blanks beneath. Notarization cannot take the place of witnesses. Store your will in a safe place. Some jurisdictions permit testators to file sealed wills with the court. They remain private and revocable during your lifetime. Alternatively, give the original to your attorney or executor for safekeeping, or use your own safety deposit box. Rewrite your will after a marriage, divorce or birth of a child. Some states invalidate a will made before a marriage or divorce, and most give later-born children a statutory share of the estate.